K2 was tasked with the design of acoustics, sound masking systems, audiovisual system design, and audio and control system programming services for Mediacom’s new headquarters in New York. 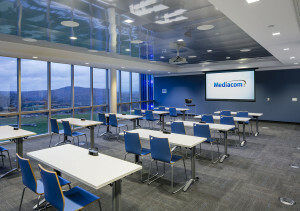 As one of the largest telecommunications providers in the U.S., Mediacom recently constructed a 110,000 square foot corporate headquarters 40 miles NW of Manhattan. K2 was tasked with the design of acoustics, sound masking systems, audiovisual system design, and audio and control system programming for the facility. The building contains over a dozen meeting and conference rooms, some of which are set up for informal presentation via large flat screen monitors, while others can also receive a variety of audio and video source material via a building wide AV distribution system. Two of these conference rooms, and a large divisible training classroom, have Videoconferencing capabilities, and one room is dedicated to video Telepresence meetings. A large dispatch center features a 12-screen video display wall to help operators dispatch and track service vehicles throughout the country. It also features teleconferencing capabilities to facilitate communication between the New York location and a similar operations center in Iowa. The lobby and cafeteria feature a full complement of audio, as well as digital signage displays and a large format video display tied into the audiovisual distribution network. 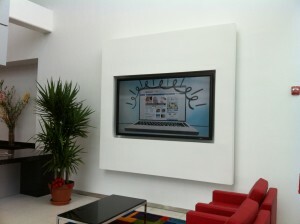 AV infrastructure is also provided in wall and floor plates to accommodate presentations and larger corporate events. A multizone sound masking system has been provided for all open plan office areas, executive areas, and dispatch center. Acoustical wall and ceiling treatments were also carefully designed and coordinated with the interior design within open office areas, large public areas, and conference and meeting rooms to provide a comfortable work environment for employees.